Catherine has been both a Registered Nurse and an employee of Fresenius Medical Care for less than a year, but twice in that time her actions likely saved a patient’s life. In both cases, it was Catherine following her clinic’s “no show/no call” protocol that made the difference. “If a patient does not arrive for their dialysis treatment, if they are a ‘no show/no call,’ my staff always calls to check on them, even if that patient is a frequent treatment skipper,” said Carol, Clinical Manager at the Woodstock, GA clinic, in north suburban Atlanta. 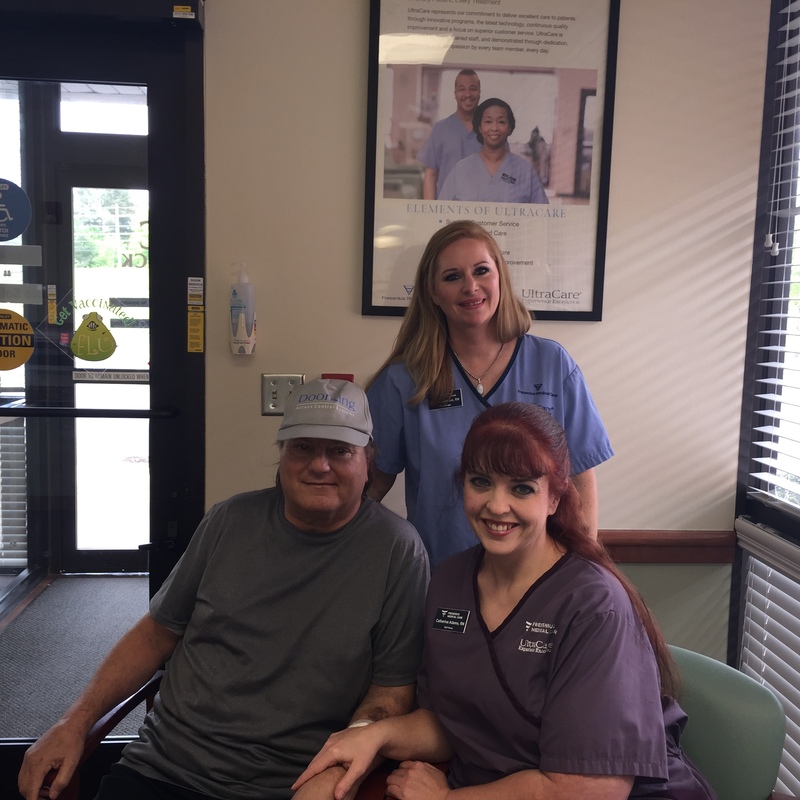 Carol, Clinical Manager, stands behind patient John and Nurse Catherine in the Woodstock, GA clinic. Catherine's next step was to call John’s emergency contact number. Shortly after Catherine's call, John was found in his home passed out and unresponsive by his wife. She called 911. Emergency Medical Technicians responded and later reported that his blood sugar level had dropped to 20 and he probably would not have lasted much longer, Catherine said. “If [Catherine] did not call his wife at her work, it is very likely [John] wouldn't have been found for at least eight more hours,” said Carol. As it turned out, John, who is 50 years old, was hospitalized for six days as doctors struggled to stabilize his blood sugar level and blood pressure. Catherine, whose mother was a dialysis nurse for 40 years, grew up in Birmingham, AL., until she moved with her parents to Georgia. She began her dialysis career as a CCHT and last August earned a nursing degree at Chattahoochee Technical College. Read here to learn more about nursing opportunities with FMCNA.